Complimentary. Contrastive. Contradictory. Feels like a continuum. Complimentary gets boring. Same reinforcing same. Creating comfort. Contradictory gets unpleasant. Argumentative for the sake of being argumentative. One must dominate. Contrastive seems to sit somewhere in the middle of all that. Contrastive seeks neither to reinforce the status quo nor dominate the conversation. It stimulates discussion and throws up alternatives. 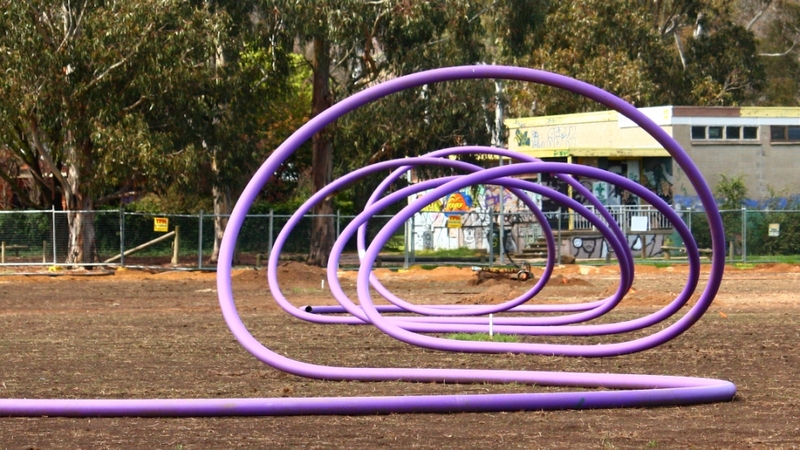 Which of these three terms describes how this purple pipe works in this image? At first glance, we might say it is not complimentary. It doesn’t feel comfortable or at home. Yet, on closer inspection, there is an echo of the graffiti on the building in the background, as if the pipe is itself a piece of graffiti in the landscape. Same reinforcing same? At the other end of the scale, the pipe dominates the image. It’s encircling arrangement seems to protrude from the surface of the photo, trying to draw us in, trap us. Dominate us. Perhaps I have not managed to select a photo that demonstrates Contrast for this week’s WordPress Daily Press photo challenge? 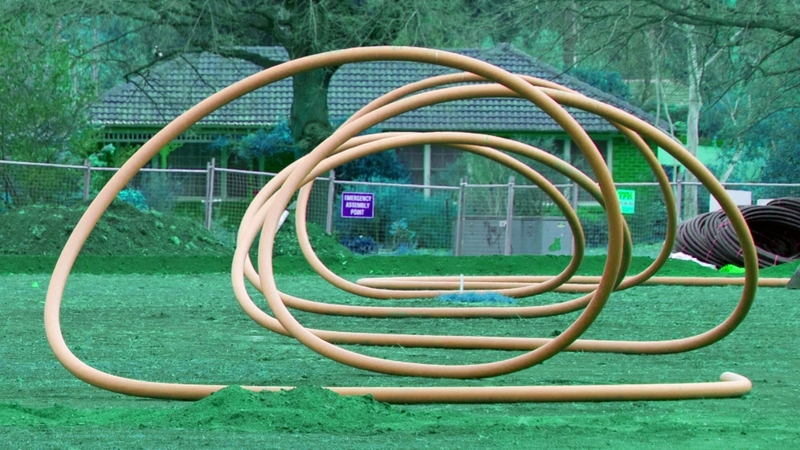 On a conceptual level, there is the contrast between the organic and the man-made, between the earth into which the pipe will shortly be buried and the plastic from which it’s made. It reminds of, raises for discussion, our impact on the environment. The sporting oval near my home was being re-turfed. The pipe captured my attention, forced me back home to grab my camera and to make the best I could of photographing it through the wire mesh of the fence. But it didn’t stop there. Back on the computer, images downloaded, sorting through them, I played with the colour settings in the editing software. This one, such a contrast (?) to the original, was the only one I saved. Looking for and thinking through contrasts is a great way to expand our knowledge and understanding of something. These two past posts are examples of just that. There is a slideshow from the first time I braved wandering the roadside by myself with camera in hand, plus my first attempt at layering digital photos. It was my first thought, too, when I took the photos. Today, in working through this post, I’m warming to the idea of 3D graffeti.